Panda Express announced that its newest culinary creation, Kobari Beef, will hit stores nationwide on September 22. Kobari Beef begins with slices of tender marinated beef tossed with wok-seared mushrooms, freshly cut leeks, crunchy onions, and crispy red bell peppers. The finishing touch is Panda's new secret Kobari sauce. 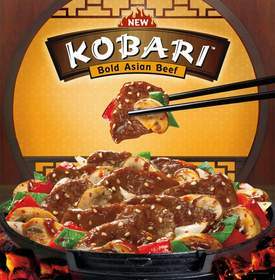 Guests seeking a culinary adventure will be delighted by Kobari Beef's Bold Asian Flavors. Inspired by the sweet, smoky, and spicy flavors found in Korean BBQ, Panda's team of culinary experts went to great lengths to fine tune the secret Kobari sauce to perfection. "We want to share the unique flavors of Asian-style barbecue and are excited to bring a first-of-its-kind flavor profile to our guests at Panda Express," says Panda Express executive chef Andy Kao. "Guests are in for a bold new experience." To help support the launch of Kobari Beef, Panda Express is leaning on its talking Panda Bear characters, Eddie and Tom-Tom, who will star in a new set of commercials featuring their comedic antics to get their "paws" on the secret Kobari sauce. Rounding out the celebration, Panda Express is hosting a Free Kobari Beef Day on September 29. Fans can sign onto Panda Express' Facebook page to receive a coupon for a free serving of Kobari Beef.